The Lokpal and Lokayuktas Bill, 2013 is Act No. 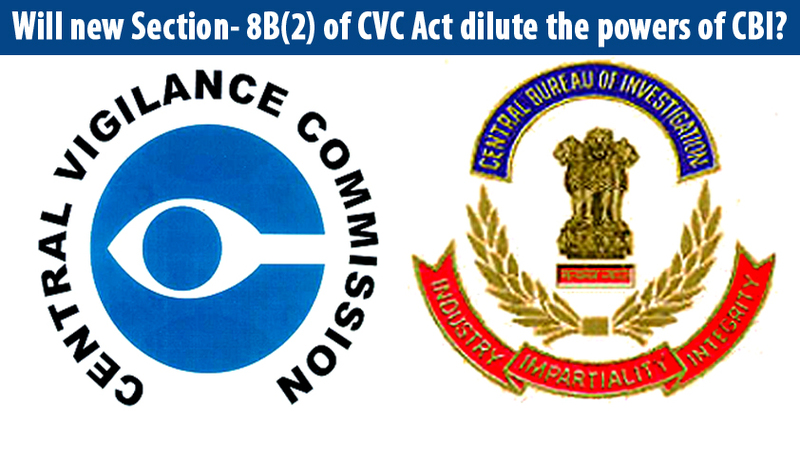 1 of 2014; Will new section- 8B(2) of CVC Act dilute the powers of CBI? The Lokpal and Lokayuktas Bill, 2013 is published as Act No.1 of 2014 in the Gazette of India, Extraordinary, Part-II, Section-1, dated the 1st January 2014. The Bill got the assent from President Pranab Mukherjee, providing for setting up of an anti-corruption watchdog. The Bill was passed by the Rajya Sabha on December 17 and by the Lok Sabha the next day. The object of the Bill is to set up a Lokpal at the Centre and Lokayuktas in states by State law enacted by respective legislatures within one year of coming into force of the Act.The Bill was first passed by the Lok Sabha in the winter session of 2011, but not by the Rajya Sabha, where it was debated and the house was adjourned before voting on it.Later, the Rajya Sabha Select Committee had suggested changes in the Bill, most of which are incorporated in the present Act. The Lokpal can inquire into offences under the Prevention of Corruption Act, 1988 committed by members of Parliament, group A and B government officials, employees of a company, society or a trust set up by an Act of Parliament, or financed or controlled by the central government.The Lokpal And Lokayuktas Act, 2013 also made amendments to the Commission of Inquiry Act 1952, Delhi Police Establishment Act 1946, Prevention of Corruption Act 1988, Code of Criminal Procedure 1973 and Central Vigilance Commission Act 2003. Meanwhile CBI sources have expressed their displeasure to the newly incorporated Section 8B(2) of the Central Vigilance Commission Act which mandates that any agency (including the Delhi Special Police Establishment) shall, in respect of cases referred to it by the Central Vigilance Commission, submit the investigation report to the Central vigilance Commission. (c) closure of the proceedings against the public servant and to proceed against the complainant under section 46 of the Lokpal and LokayuktasAct, 2013. AS per Section 8B(1), in case the Commission decides to proceed to investigate into the complaint under clause (a)of sub-section (1) of section 8A, it shall direct any agency (including the Delhi Special Police Establishment) to carry out the investigation as expeditiously as possible and complete the investigation within a period of six months from the date of its order and submit the investigation report containing its findings to the Commission. Sub-section 2 of S.8B mandates that notwithstanding anything contained in section 173 of the Code of Criminal Procedure, 1973, any agency (including the Delhi Special Police Establishment) shall, in respect of cases referred to it by the Commission, submit the investigation report to the Commission. (b) initiate the departmental proceedings or any other appropriate action against the concerned public servant by the competent authority." CBI sources say, as per S.173 of Cr. PC which have been upheld by various courts in the country, an investigating officer shall file the final report only before competent magistrate but now the new provision make it necessary to show it to CVC as well which is a serious dilution of its powers. Senior officials said they would soon write to Law Ministry seeking clarity on the issue and, if necessary, make changes in the Lokpal and CVC Act accordingly. In H.N. Rishbud and Inder Singh vs. The State of Delhi a three Judge Bench of the Supreme Court, after delineating the different steps in investigation as contemplated in Cr.P.C, has pointed out that the formation of the opinion, whether or not there is a case to place the accused on trial, should be that of the officer in charge of the police station and none else. "Viewed in that context, the CBI was under no obligation to place the materials collected during investigation before the sanctioning authority, when they found that no case was made out against the respondent. To put it differently, if the CBI had found on investigation that a prima facie case was made out against the respondent to place him on trial and accordingly prepared a charge-sheet (challan) against him, then only the question of obtaining sanction of the authority under Section 6(1) of the Act would have arisen for without that the Court would not be competent to take cognizance of the charge-sheet. It must, therefore, be said that both the Special Judge and the High Court were patently wrong in observing that the CBI was required to obtain sanction from the prosecuting authority before approaching the Court for accepting the report under Section 173(2) Cr.PC for discharge of the respondent." In Sarala Vs Velu the Apex Court while dealing with a case where in the investigation officer concerned was directed by the High Court to take back the case from the court (whereat it was laid by him after completing the investigation) and further directed to consult the Public Prosecutor and submit a fresh charge- sheet in tune with the opinion of the Public Prosecutor, after quoting the above Judgments, clarified that the formation of opinion in a case is the exclusive domain of the investigating officer and at any rate no investigating agency can be compelled to seek opinion of anybody including a Public Prosecutor even under the orders of court. The issue will be debated further especially when the court had already gone through situations where the Central Vigilance Commissioner himself was charge sheeted under the Prevention of Corruption Act.